I suspected the CPU since one pin was missing. I ordered a new one. I replaced the CPU and thought the DPX-1 was working. Then after a few uses it went all bananas again. At this point I still suspected some kind of “software error” because of some faulty CPU or memory. I disconnected everything, part by part. Still didn’t work. 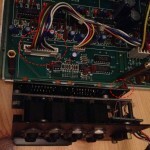 Then I disconnected the lower main board (the DPX-1 has two main boards). The upper board contains the CPU, memory and midi. The lower board contains all audio specific stuff like filters and outputs. As soon as I disconnected the power to the lower board, the DPX-1 booted perfectly. Quite fun that the upper board can work without the lower one powered up. 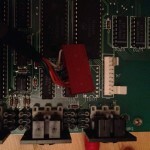 Anyway, as soon as I connected the lower board again the DPX-1 wouldn’t start. If I booted without the lower board and then connected it, the DPX-1 would hang. So there was something fishy about the lower board. I measured all voltages and they were stable. So I disconnected the power to the 8-output and cd-rom expansion card and the DPX-1 booted just fine. At this point I was very happy, but that didn’t last long since I had no output. Nothing but very low distorted audio came out of the original single output. Next thing to try was to remove the expansion card and then I discovered that the cable going from the lower board to the expansion had to be connected to a connector (J8) on the main board below the expansion card. So now there’s a big hole in the back of the DPX-1 – but I can live with that. I don’t think the 8-output expansion is usable anyway. The cd-rom is very rare and only reads cds that also are very rare. 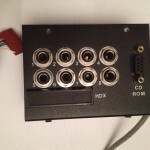 The eight outputs work the same way as on the Emax. Each voice has its own output, so every time you hit a key that sample is heard in the next free output. Eight voices = eight outputs. I’ve heard that there are some EII disks with drumkits and stuff that actually maps one particular sample to use one particular output, but I haven’t found one yet. The 8-output expansion. 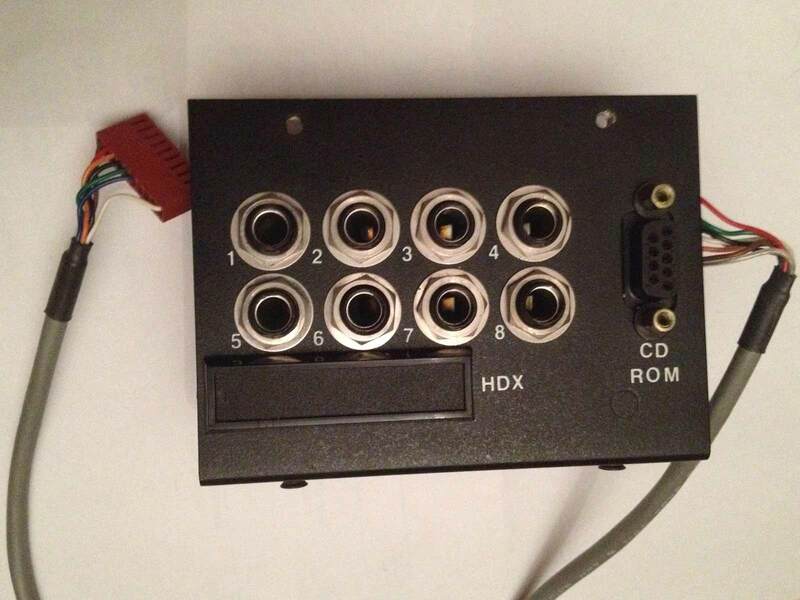 The cable goes to the CD-ROM port and should be connected to J4 on the upper main board. The expansion from behind. Up to the left is where the cable from the lower main board is connected. 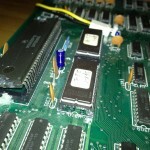 The marked connector should be connected to J8 on the lower main board as in the picture if no expansion is present. If an output expansion is present, the cable should be connected to the marked brown connector on the expansion instead. 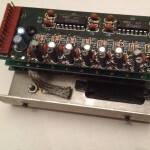 The cd-rom cable is connected to J4 on the upper main board. The CPU is loose, even though it has been reinforced with glue.